I became inexplicably teary as I listened to the accordion’s brassy tones. 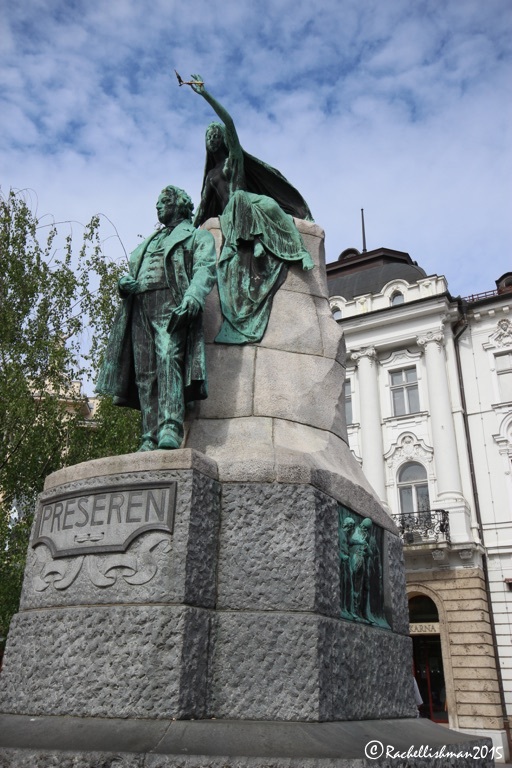 I was perched underneath a bronze statue of Preseren; Slovenia’s most beloved poet. 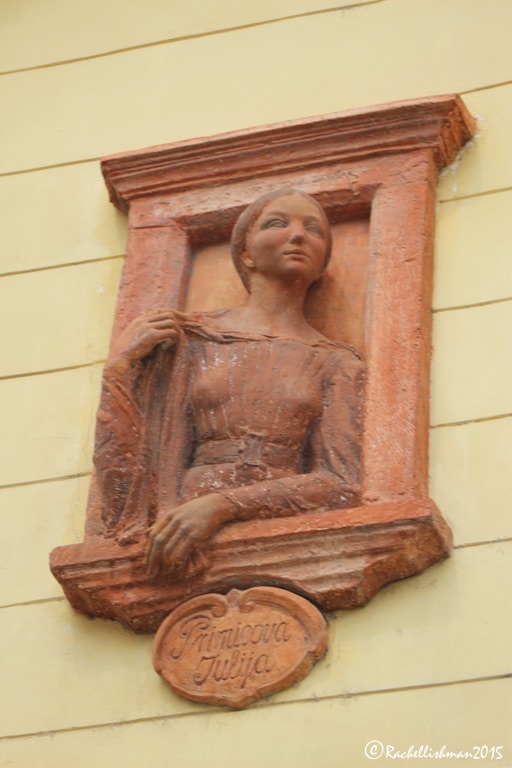 From across the main square, his ‘Juliet’ gazed back at us. As a mauve dusk settled over Ljubljana I realised that I was rapidly falling in love…and I don’t even like the accordion. Earlier that day my guide John had explained the supported theory for the city’s name; the Slavic origin of Lyoob, meaning to love or like. Of course, there are other opinions, but this seemed the most fitting. After all, how many capitals have you visited that honour a love-struck artist as their centrepiece? Preseren doesn’t straddle a bronze stallion ready for battle, but instead looks wistfully at his unrequited lover. For me though, this fabled love story was merely the icing on the cake. The little time I’d spent meandering through Ljubljana’s streets and riverside cafes had thrown it directly into my top five cities worldwide. Or, as John had joked, not so much a city, as a well supplied, ideally located, amiable village. 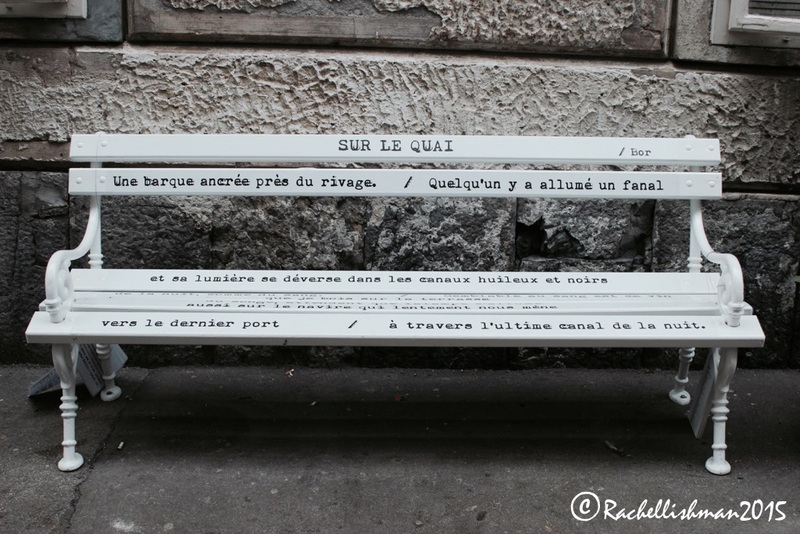 Multi-lingual poetry benches line this small street in the city centre! It seemed to me that the town council had gathered to ask the question: What are a few of your favourite things? This is a place where people eat ice cream for breakfast, where sculpture, music and poetry are prolific and free: scattered throughout any meter of public space. Cars are out and bikes are in; people smile and say hello to strangers; there is no commute. Hell, even the pigeons are clean and healthy and the graffiti waxes lyrical about peace and love! Put all this cheery wonderfulness into the context of Slovenia’s both distant and contemporary past – a country almost constantly within the clasps of unforgiving empires, dictatorships, and most recently an economic crisis – and you gain even more respect for the feel of the place. Naturally, even jovial John admitted that Slovenia, like most of Europe, is still trying to recover financially, but what I found overwhelming was everyone’s positivity. Slovenia has certainly bounded forward since the end of Tito’s reign and the disbanding of Yugoslavia in 1991. It luckily escaped the worst of the war that ensued, due to (according to John) an overpowering majority of its people voting for immediate independence. Since then it has accepted and even embraced its sometimes-morose history, and its culture as an independent nation has blossomed. In 2004 Slovenia joined the EU and three years later took the Euro: the first former communist country to do so. These transitions combined with an extremely friendly welcome, is why tourism is flourishing. In fact, if I was being pedantic, that’s the only possible negative I can find about Ljubljana: I worry that in the future; this small city will become overrun with hoards of unappreciative visitors hunting for their next pint of cheap Lasko lager, marauding past Preseren without as much as a glance. I can only hope that after centuries of coming under siege from more abrasive nations, Ljubljana’s unique spirit doesn’t finally fall to the takeover of mass tourism. My parting gift was a climb to the ramparts of the city’s ancient castle. No longer needed for defensive purposes, the stone towers now take full advantage of their panoramic view. Looking down on the orderly red roofs and leafy, wide avenues, I decided that I would come back. Next time for longer, and with a bigger budget for eating. Because who wouldn’t want to gorge on ice cream for breakfast? I loved reading this (and the bench with poetry!) – but it’s almost tragic that I decided to skip Ljubljana because of a paucity of time when passing through Slovenia last year. Did spend a day in Bled and I was totally surprised by how clean and fresh everything was – the air, the lakes, the rivers – almost unreal. Ah it’s such a shame you didn’t get to visit – you’ll have to visit on a future trip! I was also a little disappointed that I only had just over a day there – although it’s a small city to walk around, I could have easily spent a week there just relaxing by the river and eating great food!! What a pretty place, with all the greenery surrounding it. I can see why you enjoyed it so much. It sounds too good to be true. What a lovely place and experience you had. I like that you use local guides when traveling. I rely too much on guide books and am I’m missing out on local flavor. Thanks Lynne! Yes the last few times I’ve been into Europe I’ve been lucky enough to meet some great guides – I especially find the free city tours amazing for being able to meet and chat freely with a local who’s really proud of their home – makes me feel closer to the place somehow! 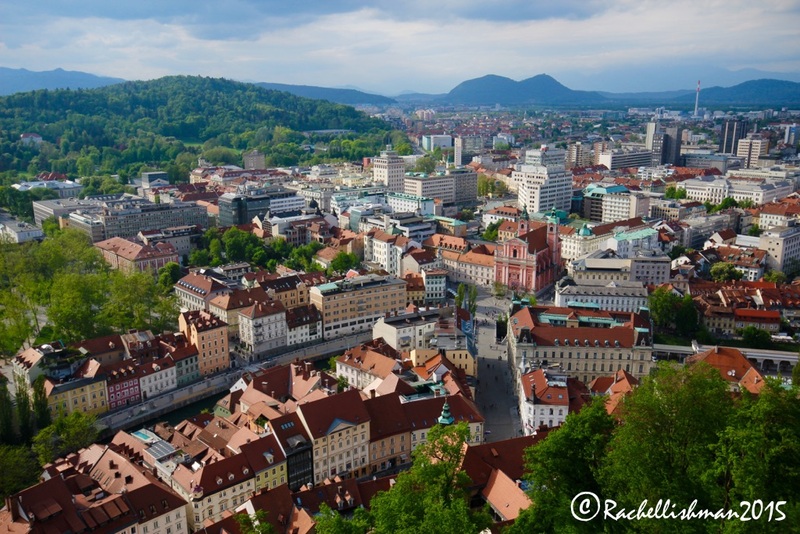 I so want to visit Ljubljana! I keep hearing more and more great things about the place and ice cream for breakfast?! This definitely makes me want to visit! I went on a long-weekend solo trip to Ljubljana about a decade ago, and took a great liking to the city. Attending a spontaneous symphony performance, and getting front-row seats was one of the highlights. Unfortunately, since it was cold, I didn’t make it up to the castle – yet another reason to return. 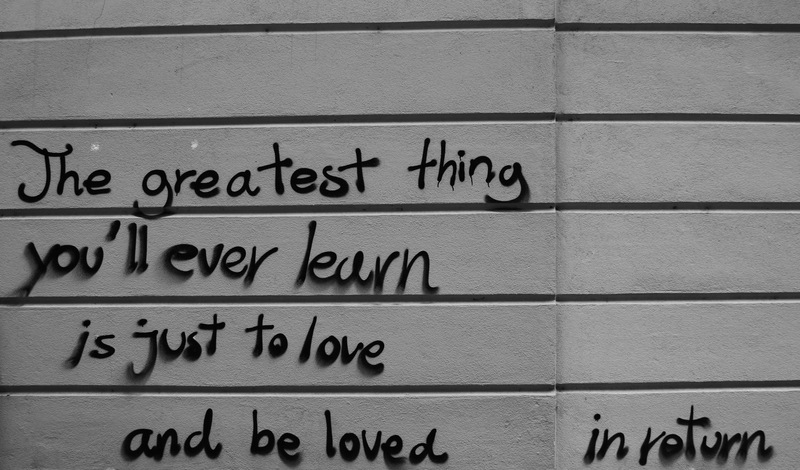 And, while I’d heard that its name is related to the word for love, I’d not yet known about the legend you opened with. Interesting! Thanks Tricia. I hope you’re able to return one day soon to see the castle and experience other aspects of the city – there really is so much to do there! Dear Rachel, as a born and raised Ljubljančanka (this is how Ljubljana’s girls are called), I have to thank you for this wonderful piece about my hometown. It just makes me even prouder to be living here 🙂 As for your worries on the mass tourism – I share the view 😉 Have a wonderful day! Thank you! It means a great deal that you, as a local girl liked my story of the city. I had a wonderful time there and would also be very proud to call it my home! I hope I can visit again soon 🙂 It’s one of my top 3 cities in Europe without a doubt! Thanks for the lovely feedback 🙂 I’ve discovered I’m not alone in my love for this place and like you, spend most of my time encouraging friends to take a trip there!